Like L.A. Confidential, this film begins with stock/news reel footage. Come to busy Sheffield, the steel city of the future, bright, busy, and growing. Now, thirty years later, the steel city is rusting, its steel shops closing down, its men gathering in Job Clubs where they learn to write resumes and application letters. It is a world where men are real men until they have to question just what that is. Because as lovers, fathers, and providers they feel themselves to be failures. In this climate, a man has to be creative to earn a bob. He can steal girders (no pun intended) to sell for 20 pounds each, or, in this case, form an all-male stripper revue. 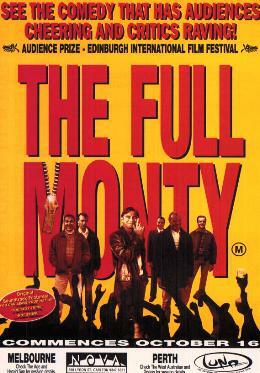 This is a comedy with heart, giving the men dignity in their struggle for it, proving that making the effort is enough to keep your self-respect, and that going the full monty (taking it all off) can be the ultimate expression of self-acceptance. The audience had a wonderful time with this film. Men stripping for women is less about control and power than the other way around, and we can have a good laugh about a group of average blokes learning to strut their stuff. Women doing the same thing (a la Striptease) is less the subject of good humour.